NSM launches massive campaign to fight Trump’s extremist anti-immigrant agenda. Sign up today! This is terrifying. Trump’s campaign of hate, racism and exclusion took the White House. The backlash of white voters was harsh and strong, and Trump’s rhetoric now has the power of the White House behind it. As people of faith, in times of hatred and persecution, we respond with fierce love and compassion. With courage and faith. With risk and solidarity. With bold action. Let us ground ourselves deeply in our traditions and get organized for the struggle ahead. 1. Emergency escalation of Sanctuary in the Streets. In the next two months, we will be recruiting 1,000 people to disrupt immigration raids. We will host nonviolent action trainings throughout the next two months to train and prepare. To sign up, please email maria@www.sanctuaryphiladelphia.org. 2. Doubling our congregations. We will need to double our efforts to stop Trump’s mass deportations and anti-immigrant agenda, and this starts with doubling our membership. 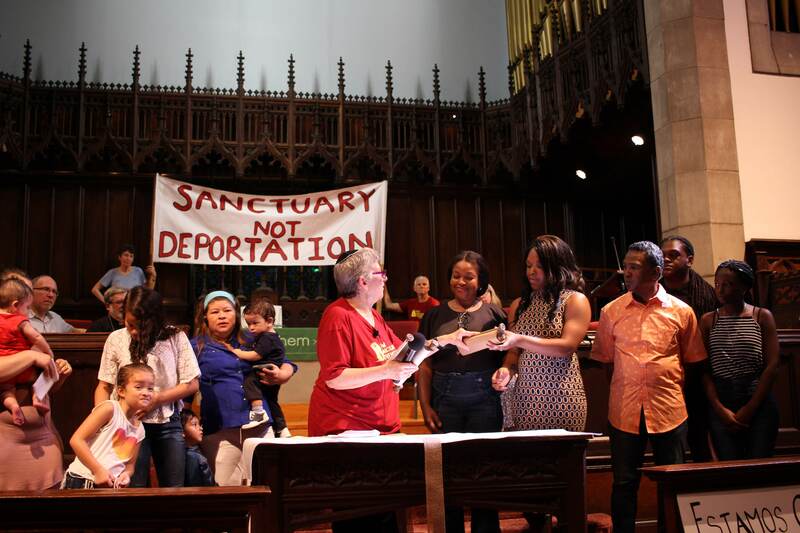 Please email peter@www.sanctuaryphiladelphia.org if you have contacts at another congregation that may be interested in joining the movement for immigrant justice. 3. Building our Staff. Organizing on this level will require the funds and staff to do so. We have built a strong and effective community, and now is the time to build on that. We are launching a campaign to raise $70,000 to hire two more organizers. Click here to donate today. 4. Join us for a member meeting on Thursday, 11/10 at 6pm at Visitation BVM’s cafeteria to debrief the results and lay out next steps. Visitation is at 300 E. Lehigh Ave. The cafeteria is in the basement of the school, which is to the left of the church. We will also be working with the National Sanctuary Movement, connecting with congregations and organizations across the country to strategize a broad, national faith based movement.